Digital Arts festival Pausefest is back for 2012 and open for submissions! 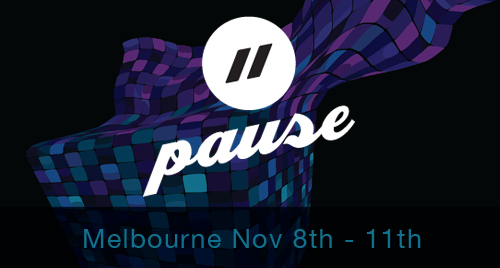 Announcement from Melbourne, VIC, After a successful debut in 2011, Pause Fest – Melbourne’s first digital festival, is back with a bang! In 2012, Pause Fest adds another exciting element to the festival and will be themed: Future. This theme will dictate the festival branding, featured material and all other aspects of the festival. With the submissions now open, Pause Fest is asking all artists and agencies to ask themselves: What does the future hold? Pause Fest is calling all creatives, designers, web designers and artists working in the digital fields or creating anything interactive and technologically innovative to submit their work to be featured at the festival and on the website in 2012. If you produce great animation and short film pieces, interactive installations and all things digital head to the Pause Fest website Submissions link for more information on getting your work featured at the festival. To view photos / videos and reviews of the past event click here. Submissions for the festival close August 1st. For more information and examples of past submission please visit: www.pausefest.com.au.